What a great pinata... How did you make it? we took a balloon and covered it with newspaper paper machee, did a couple of layers, left a little hole for the candy, popped the balloon, added fins and a tail and put in the candy then paper macheed over the hole. Then we paper macheed over the fins and then we paper macheed on red tissue paper (you use a paint brush and paint the paper machee paste onto the tissue paper cause otherwise it will rip) we did several layers of that then added google eyes, drew on the mouth and covered it in stickers . It was fun but my DS mostly just covered the kitchen and both of us in paper machee paste while I did most of the work lol. That is soooooooo cute! Great job! Great job!! This was an awesome weekend for his party. Wish we could have been there. Good job - it looks great! 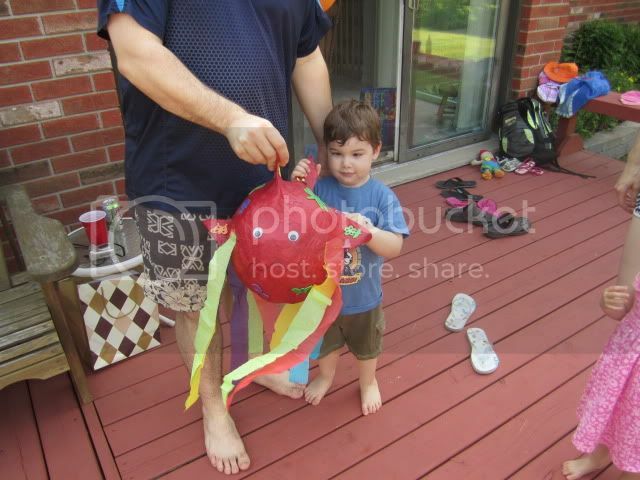 What can I put in a pinata?